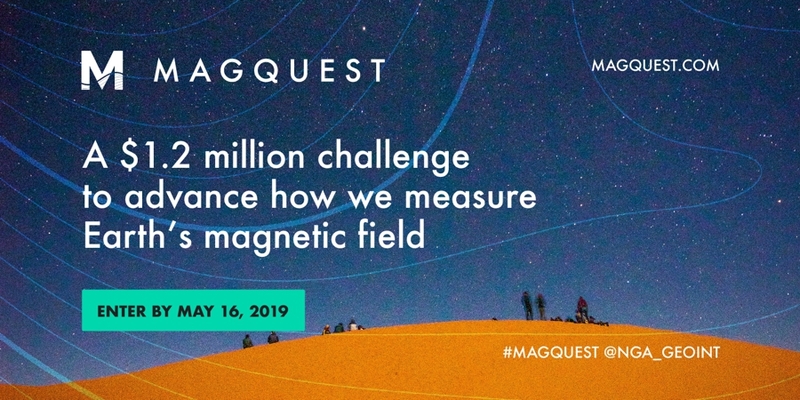 On 21 March, the US National Geospatial-Intelligence Agency (NGA) launched MagQuest, a $1.2M open innovation challenge to advance how we measure Earth's magnetic field. The challenge is seeking space-borne, aerial, terrestrial, and other potential solutions for geomagnetic data collection for the World Magnetic Model. The competition aims to come up with innovative magnetic field observation programs to provide data of sufficient quality and global coverage for production of future World Magnetic Models (WMMs). The Earth's magnetic field is generated by motion of the iron-rich fluid in the outer core and is constantly changing. Compasses are oriented by the magnetic force at a user's location and the difference between geographic and magnetic north is provided by the WMM. This model must be regularly updated. Amongst other things, the WMM is used in navigation and by smartphones. The WMM is produced by the US National Oceanic and Atmospheric Administration (NOAA) and the British Geological Survey (BGS) at five-year intervals. Recent erratic changes in the northern polar area, including the location of the magnetic pole, led to the release of an out-of-cycle update to the WMM in September 2018. Production of the WMM currently uses space-based magnetic field measurements provided by the European Space Agency Swarm mission. The Swarm mission will end in the mid-2020s and there are few other measurement programs that will definitely be able to supply the required data. Ground-based observatory data are also used but on their own are inadequate to make a WMM. The US government is therefore taking a proactive approach to identifying new methods of data collection. The observation programs envisaged could involve small satellites, aircraft and drones as the measurement platforms, as well as ground-based magnetic field observations. Susan Macmillan, senior scientist in geomagnetism at the BGS is a judge on the panel. She said this is great opportunity for innovation, as well as putting forward ideas to improve or extend existing observation programs. Those interested should submit their concept by 4:59 p.m. EDT on May 16, 2019 at www.MagQuest.com.